The 1964 Avanti R3, serial number R5643, was the last Studebaker Avanti production model. The car is part of a large collection at the Crawford Museum in Cleveland and has been displayed at the Studebaker National Museum in South Bend, Indiana. The last cars bearing the Studebaker name were all made in Canada. These were the 1966 Cruiser 4-Door, the Daytona Sport Sedan, the Wagonaire, and the Commander Sedans. The Lark name was not used on any Studebaker models produced in 1966. These last models may have been the finest cars that Studebaker ever built, at the least they were the company's best attempt at honoring the conventions of the time. 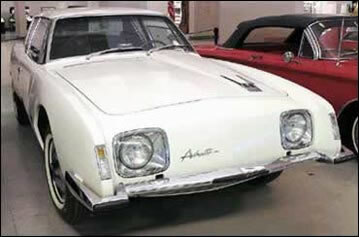 The very last Studebaker rolled off the line in Hamilton, Canada in March 1966 – and has been displayed at the Studebaker National Museum in South Bend, Indiana. 1964 Studebaker Avanti, R5643. Photo courtesy of the Crawford Museum. The 1966 Daytona Sport Sedan may have been the most mainstream car Studebaker ever built.